Australian recovery unit Middle East 1942. Australian ute but where did the flares and dual wheels come from. Chev or Ford probably. Looks like Australia invented the dually pick-up! Or were Australian Army workshop blokes the first hotrodders? Last edited by Lang; 10-02-19 at 08:18. Yes I've seen that pic. Looks like a Aust. 1940 Ford coupe ute ( split rear windows ) fitted with unusual rear wheels possibly 900-13. Wow, that is such a smart looking vehicle. Great lines. I think you are close. It looks like they have just cut the rear guards/fenders out to fit the wheels. I looked at one of those utes during a Corowa event years ago. The little town between Corowa and Albury , NSW side of the river. The chap wasn't home but he had a junk yard with lots of stuff . He was selling a 1 ton army Ford 01Y but he had the coupe ute in the yard. The coupe ute was restorable but needed a lot of work. I bet that was the yard at Howlong, remember going there a few years back, place was full of vehicles of all ages. There was no one home then, his mailbox was overflowing ! Those rear fenders look like they have a proper rolled outer edge finish. Would that type of work have been bothered with in the field, or could those fenders have been taken from a different model Ford with the same wheel well radius? Cute as a bug, either way! Those workshops had lots of people with very high skill levels from their former civilian lives. Body builders would have been among them. As anyone with military service knows, no matter how hectic the work, there is always time for interesting "foreign" orders. Probably some keen young officer suggested it or complained about getting bogged all the time and the workshop blokes took the baton and ran with it. Quite possibly a few cartons of beer fell out of the back of a truck near the workshop. Last edited by Lang; 11-02-19 at 03:42. Yes that would be the place for sure. I remember the ute in question had a rusted out floor pan. I rang the hot rod business in Castlemaine , they made new Ford panels for the 1930's , 40's cars . The chap said yes, they have a new floor pan for that ute ... rather expensive project so I left it. 56623 appears to be a 1938 model ? 70563 116552 is a scene at Corowa airport ! Last edited by Mike Kelly; 11-02-19 at 02:56. Movement Un-controlled has a three tone cammo .... no, I am not going to hazard a guess as to the colours!! The Corowa a/port images have an Erg standing on the roof to fill that whatever it is on the Beaufort. No wonder the roof is always dinged-in! I had a 11Y with a sunshine cab that went to Dinger Belfield, who finished it quite nicely. That model had 900-16 tyres and a quick diff so should have motored along well. An ex-1Div vehicle which still had some original markings. Thanks Lang, for the correction - I'd always known it as 'erg' as that was what my father always referred to he and his fellow RAAF engines & airframes fitters' as. He was an RAAF LAC during '44-45. More importantly, what is that thing slung under the wing that the bloke on the roof of the ute seems to be filling? Beer carrier? There were reports of cross channel beer flights to ensure that those who preferred English beer over French wine didn't have to go dry. If they climbed to suitable altitude the beer would arrive cool or cold depending on preference and chosen altitude. In the first Beaufort photo the tank under the wing has a large diameter tube clamped at the lower back end of it with what appears to be a nozzle at the end of it facing aft. A similar sized tank looks to be sitting vertically in the back of the Ute. Could this be smoke screen laying equipment being prepped? I think David is getting close. It is obviously some improvised object as the big tube hanging down has no aerodynamic consideration and in fact it must be pushed up almost horizontal by the air flow in flight. If it is strong enough to stay vertical - does not look like it - it would be serious drag. After looking at lots of photos showing no external load racks on Beauforts found this one. The aircraft in flight is the standard set-up in dozens of photos. Last edited by Lang; 11-02-19 at 21:31. DAP Beaufort Mk VIII had provision for a single 250 pound bomb under each wing. Looks like my New Guinea line up aircraft is not a rack but directional aerials. Found it. Whatever the gas is it can not be too bad with the blokes in shorts and bare arms. 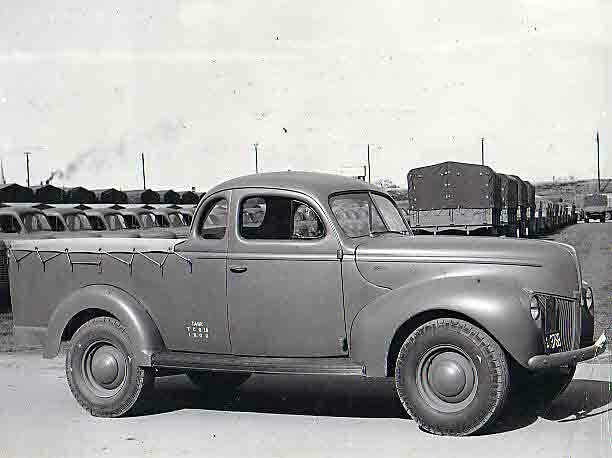 Ute is a 1938 model. COROWA, NSW. 1943-03. FILLING THE CONTAINERS ON A BEAUFORT BOMBER OF THE RAAF WITH A MIXTURE (MODIFIED S. 2) USED FOR TRAINING PURPOSES AT THE LAND HEADQUARTERS GAS SCHOOL AT BONEGILLA. THIS MIXTURE WILL BE SPRAYED FROM THE PLANE OVER A PREPARED AREA AT THE GAS SCHOOL. Last edited by Lang; 11-02-19 at 23:10. Down in the Sale and Bairnsdale area the Beauforts were christened 'Gippsland Hailstones' because so many of them either crashed or dissapeared in Bass Strait. The problem was I believe a faulty elevator control cable. I guess most of us have seen the movie of the Beaufort flight where one hits another and falls into the sea. "The two Beauforts A9-27 and A9-268, of the RAAF's 8 OTU, collided over Jervis Bay on 14 April 1943 while performing a 'Prince of Wales' break for people of the media." "All eight crew members were killed when both aircraft hit the water: Crew of A9-27 F/O Raymond Sydney Green (Pilot), F/O Maurice Francis Hoban, F/Sgt Eric William Sweetnam, Sgt Albert John Bailey. Crew of A9-268 F/Lt David George Dey (Pilot), P/O Jack Norman, P/O Rex Lindsay Solomon, Sgt Hugh Sydney George Richardson." You can help Keep Mapleleafup Up! See Here how you can help, and why you should! Interesting how this thread has morphed, Lang. I looked up the Gas School and it appears to have been quite an establishment, involved in development of warfare chemicals, both offensively and defensively. In the process, I ran across a low resolution photo of a Beaufort making a pass over some part of the school, laying a smoke screen, but the plane was too far away to get any details of the equipment it carried. I would suspect, however, that the aircraft attached to the school probably carried quite an assortment of kit, and it was constantly changing. I have never looked at Beaufort statistics before. This aircraft must have the worst safety record of any plane axis or allies during WW2. Absolutely unbelievable they persisted with them! Their P&W engines were probably some of the best and most reliable of all time (same as the DC3 and Liberator) so the aircraft must have been crap. The poms only built 400 (with Bristol engines) of them before they were withdrawn from active service in 1942 and declared obsolete in 1944. Meanwhile Australia kept punching out 700 so they could maintain the aluminium hail storm anywhere near where they flew. The squadrons that got B25 Mitchells or A20 Bostons must have been dancing in the streets. The unsung Hudson/Ventura blokes who are unrecognized for doing more useful bombing and strafing than any other Australian type and having more shot down (as opposed to falling out of the sky like the Beauforts) would still be pleased to not fly Beauforts. They pulled the Vigilante dive bombers out of service because of accidents but they have a 5 star rating when compared with the Beaufort. Last edited by Lang; 13-02-19 at 05:04.